The team will be live on stage and ready to answer your questions at the Royal Geographical Society in London on the 21st June, as part of the Women's Adventure Expo's 'Heritage of Women in Exploration' event. Having returned to Longyearbyen for a hectic three days of science debriefing, equipment de-rigging and press, the team have now all returned to their home countries. Some have returned to wonderful welcomes at the airport and a great deal of media attention. This is great as it will help us to spread the message of our expedition....one of positive belief and optimism for a better future. We may have reached the North Pole but what will really determine the success of the expedition is what we do next. Next we must put effort into sharing our experiences, stories and insight with as many people as possible, engaging them in the subjects we think deserve attention....but first, the team is allowed just a little rest! The team arrived safely at the North Pole just before 1900 on the 21st April 2018. Having skied just over 80 km the previous 7 days and with a particularly gruelling last leg the team arrived tired but in good spirits. They were met by their sponsor Eugene Kaspersky who flew out by helicopter to meet and celebrate with them at the top of the world. Everyone was delighted to be reunited with Saudi team mate Mariam who flew out to the North on the helicopter with Eugene. It was an emotional reunion. The team have now flown to Barneo ice camp which is 45 km from the pole and tomorrow they will fly back to Longyearbyen. Tomorrow the team can expect wifi and you can expect better photos! Tough day skiing today! It was only -9 degrees (so warm)! But that meant soggy and slushy snow to ski through. For the first day of the entire trip the drift of the sea ice wasn't helping the team along and every inch of gain towards the pole was due to their own efforts.There were a few exciting crossings over open leads and generally it has been a long and tiring day. But they are pushing on for a few more hours as they are getting closer to the pole and they are excited to get to their destination. It was a sunny, balmy -24°C/ -11°F on the sea ice yesterday. The team have a daily target of around 10 km gain on the pole daily and they smashed it making a gain of 12 - 13 km today. They made such good progress because the terrain today was very flat and so they had some easy skiing with the only hurdle an ice boulder field which required a lot of scrambling over and around. The ice fields are tricky to traverse, if its even possible to traverse them but the are made up of stunning blue chunks of ice so they are really beautiful to be around even if they do make the day a bit trickier. This photo of a lead is from a series which have been captured and shared on Instagram thanks to our sponsors Kaspersky Lab. There have been some beautiful images shared of the team and we recommend you check out his feed renan_ozturk. A 4 km gain on the pole while you sleep?! Yes, please. Shame that the drifting ice most likely was the cause of the large ice rubble patch the team couldn't traverse today and had to do a long ski around, to the south. You win some, you loose some! The team crossed their first lead today (a large fracture within an expanse of sea ice) which was a pretty spectacular experience for them all. Totally acclimatised now there where no mention of the weather until pressed when they agreed it was a bit windier today and a little warmer but no one had any idea what the temperature actually was. Day 2 was a tough day for the team. They gave it their all and travelled 9.5 km today. The shifting ice and the chunks of blue ice have provided a stunningly beautiful backdrop on their journey to fulfil their life ambitions. Everyone gets obsessed by food on expedition. We will be eating very well. We have a four course meal for the evenings....instant soup, followed by noodles, then a Summit to Eat main and a Summit to Eat desert (and if we have room, a Tribe protein bar as a petit four). We've been trying out some of the Summit to Eat Meals - and they are good! The Chicken Fajitas are a bit of a favourite already. But most popular of all are the freeze dried berries that we've made into a trail mix....blueberries, strawberries and raspberries....Mmmmm. It took us all day to sort it all into bags for each tent team and then get it in the sledges. We have about 1kg of food per person per day. It's a lot of weight in the sledges right now but at least it gets a little bit lighter every day! Today we went to collect our skis and the last remaining sledges. 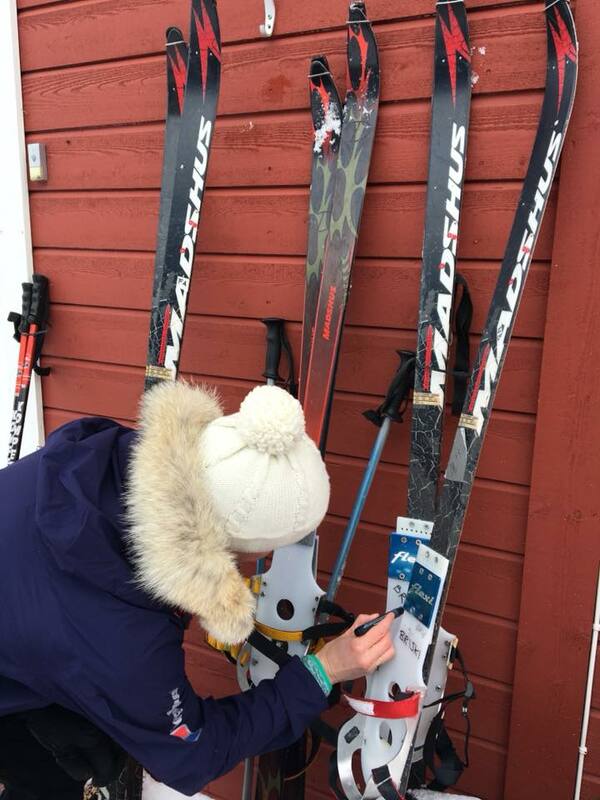 Our skis have odd bindings but they are designed to enable us to wear big, padded boots while using the skis, rather than regular ski boots which would be too cold. Having our skis and boots - and seeing the sledges packed and lined up outside our HQ - made it all seems very real. We are almost there! No, not the Arctic Ocean. But still, it was ice. Today the BBC film crew wanted some beauty shots of the team pulling sledges on ice...and they got not just beautiful but spectacular! It was great for the team too - our first tentative steps onto ice, albeit just some ice adjacent to the coast of Longyearbyen beach. We will be becoming much more familiar with ice in all its forms over the next month. The team looked great, strung out in a long line - but they weren't the most interesting sight on the beach....that place was taken by a group of French students that passed them before jumping into the water for a swim. We intend to do absolutely zero swimming of any kind on our trip! With all team members in Longyearbyen it was time to start banging the drum about our imminent departure! We'd like as many people as possible to share in our adventure and follow our progress so we need to shout about our expedition a little bit. Last night we had a lightning quick photoshoot with Esther Horvath, renowned conservation photographer who specialises in the Arctic Ocean. She had literally just stepped off a flight from Greenland where she had spent three months at Station Nord, a Danish military station in the very North of Greenland that supports scientific work. Today we have spent time with the BBC recording in Arabic as well as English. We'll be doing more tomorrow and perhaps even a live radio broadcast....we've been well trained after making 15 episodes of Polar Exposure! We were super happy to see Misba last night after her long day of travel from Manchester, UK. As she settled into the cold and we sorted out the equipment she brought with her, four more team members were travelling North towards us from their respective countries; Olga from Russia, Anisa from Oman, Steph from London and Lamees from Kuwait. Welcome Ladies! But if we think our logistics are complicated, spare a thought for the team setting up the floating ice station and runway known as 'Barneo'. They currently have two helicopters flying north across the lonely Arctic Ocean from central Siberia. They will fly to around 87 degrees before running out of fuel and landing on the ice. A plane will be called in to make a fuel drop to the helicopters so that they can continue on to a spot around 89 degrees. They will choose the best spot before calling in the plane a second time, this time to drop tractors so that they can clear a runway. It's an impressive operation! Our final four team member meeting en route to Longyearbyen. Today we found a very special spot in Longyearbyen to record our latest podcast. Slightly up the side of the valley with a great view of the town is Longyearbyen Church. It is a very pretty wooden church with a large reception room - warm, cosy, quiet and with the best views in town of the surrounding mountains - a perfect setting for our first Arctic podcast. From year to year the Arctic Ocean Sea Ice conditions can vary dramatically. 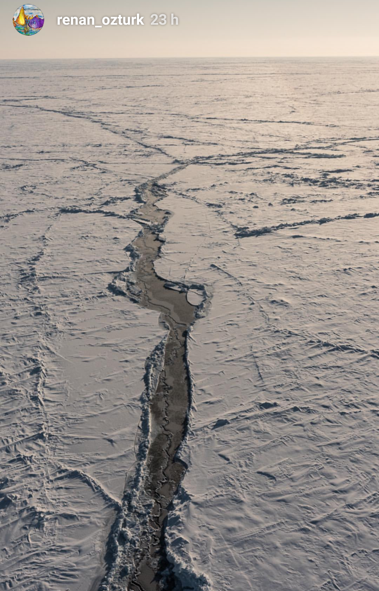 One year teams traveling to the North Pole might report vast pans of dead smooth ice with hardly any obstacles, while other years skiers experience ice that is on the move, clashing together to form pressure ridges or splitting apart to form wide leads of open water. 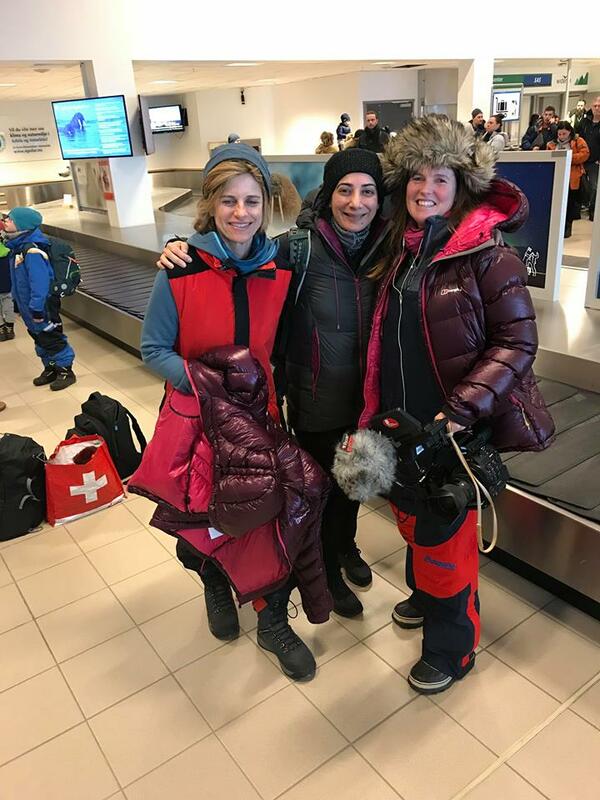 The first people to see what the ice is like on the ground will be the teams setting up ice station barneo (we heard today that the helicopters have finally left the mainland and are headed north to scout for a runway location on the ice...). Until they arrive all we have is the sea ice data gathered by satellite. 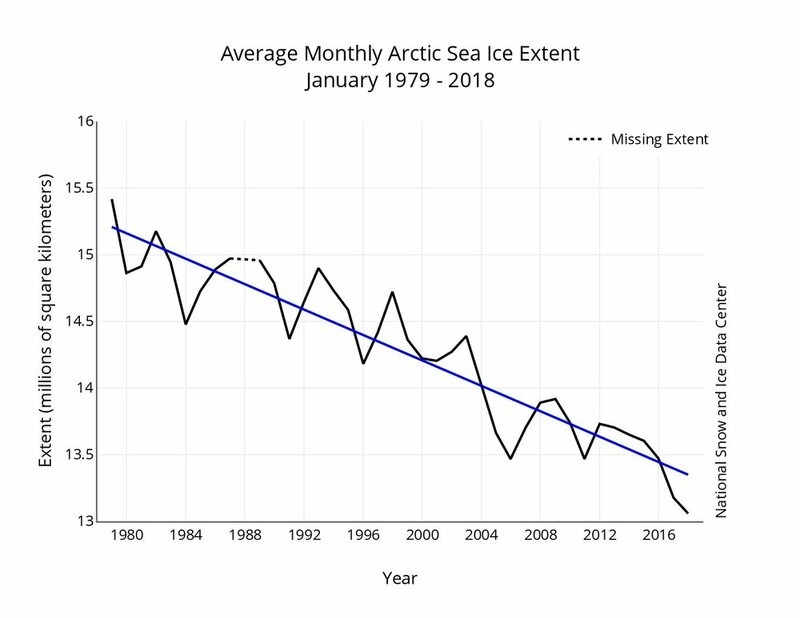 In January a graph was released showing that the average sea ice extent was the lowest for that month in the satellite record (since 1979). The data for March showed much the same thing....this time the average sea ice extent was the second lowest for the month in the satellite record. However, sea ice extent is the area covered. There is also data about concentration and this - for us - is slightly better news. The Snow and Ice Data Centre provides daily updates or sea ice concentration in the Arctic Ocean and it shows 100% concentration around the Pole. Could this mean a good year? A little exploration...inside a glacier! Today the team had a little time to take a break from all the frenetic preparation and went off to explore the area around Longyearbyen. Ida and Asma climbed up to some ice caves above the town. The tunnel-like caves allowed them inside the glacier to look at the ice from within. How was the temperature in there guys?! The advance team is growing! Mariam arrived in Longyearbyen from Saudi Arabia today. It was a relief to see her safely off the bus from the airport alongside three big bags of supplies for the team rations (Thank you Panda Supermarket!). So that makes six out of 11 team members. BUT we are already a much larger team than that! The POWER team are Audrey and Jessica; the documentary team of three are here too - and soon there will be more. Slowly, slowly we are taking over this town! As for the advance team, who have now been here five days, we practically feel like locals! Looking forward to more arrivals in the coming days.